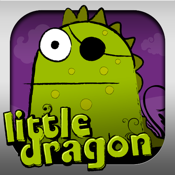 Little Dragon is a fast paced platform game. It's all about speed and agility when you take control of Little Dragon. Survive waves of monsters while jumping around platforms. Grab chewing-gum, it's Little Dragons source of energy. SMASH, SHOOT, BOMB and BLAST monsters and collect coins to buy new ammo. Explore this one stage game with different unique level designs - beat the higscore and be a true dragon master.